Following Noel's death in 2013, his wife Lori put all of his later albums on the internet so fans could download them for free. As well as the albums which were released during Noel's lifetime, Lori also released the album Live at McCabe's and Songs 4 Jimmy, a collection of demos Noel had recorded with the plan to revisit later. The McCabe's album features seven tracks and includes Noel's only recording of Fred Neil's song, The Dolphins. Also on the album is a song called Dear Sarah (labelled Barbara Allen below) which again was not previously included on any of Noel's albums. The tracks were recorded at McCabe's Guitar Shop in California, a live music venue which has played host to acts such as Beck and Joni Mtchell. 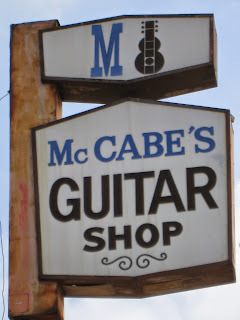 This was one of many live shows Noel did at the famous McCabe's Guitar Shop in Venice California. It was never made into a CD. As well as the Live at McCabe's album, Lori also released Songs 4 Jimmy after Noel's death. The eight tracks were recorded roughly by Noel as a musical guide for a future project with guitarist Jimmy Smith, who he often collaborated with. The recordings include a beautiful version of Leonard Cohen's Hallelujah and one of Noel's most contemporary cover versions with his recording of the 2006 Fratellis song, Whistle for the Choir. The album also includes Noel's versions of the songs Lush Life and If I Had a Boat, which had not been included on albums before and regular live favourites I Want to be a Cowboy's Sweetheart and If I Didn't Care.